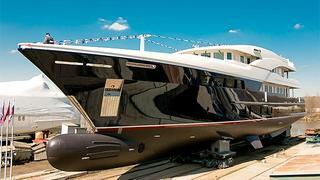 Timmerman launched their 19th unit earlier this week, the second superyacht from their TM 47 series. Currently known as hull number TM 47-2, this new 44.75m superyacht comes from the yard's flagship series introduced in 2008 with the yacht Alexandra, now renamed Latitude. This yacht has proven her efficiency with extensive cruises around the world. DNV registered like her sistership, the TM 47-2 is designed by Vripack and built in steel and aluminium. She accommodates 10 guests in five cabins plus crew quarters for 10. Thanks to twin 537kW Caterpillar engines, she achieves a top speed of 13 knots and a range of 4,000 nautical miles at 10 knots. The TM 47-2 will be delivered to her owners this Autumn.